Vacaville resident Jeremy Wirth had taken his dirt bike to his construction job site with plans to ride in a nearby open field after work. What he didn’t plan on was an injury that would hobble him for nearly two decades. ABOVE: Jeremy Wirth of Vacaville is back to enjoying the outdoors and other activities following a total ankle replacement surgery. Unbeknownst to him, however, a new ditch line had recently been dug in that field, changing the terrain dramatically. When he took off, he crashed into that ditch at full speed, shattering his right ankle. “I knew I was hurt and when I got up, I could see that it was broken,” he said. Lying in the ditch, the then 26-year-old had to figure out how to get out of it and find help. Unable to kick-start the bike, he managed to use his hands to start it up, pulled himself up on his good leg and hop/rode himself out of the ditch. He was able to flag down a passing 4-wheeler to give him a ride back to his work site and call for an ambulance. That was 17 years ago. After a couple of surgeries to put screws in place to hold his ankle together, Jeremy figured life with constant pain in his ankle was just his lot in life. Total joint replacement is a surgical procedure in which parts of an arthritic or damaged joint are removed and replaced with a metal, plastic or ceramic prosthetic. Since 2007, orthopedic surgeons at NorthBay have routinely offered total knee and hip replacements. In 2015, shoulder replacement was added. In 2017, ankle replacement became part of the Joint Replacement Program. A heavy equipment operator, Jeremy found that his ability to work on the mechanical end of things was limited, as well. “I couldn’t crawl around or under the equipment and stuff like that,” he said. So he asked his doctor for a referral to an orthopedist. 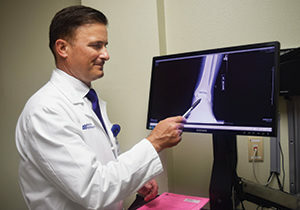 That’s when he connected with NorthBay Healthcare foot and ankle surgeon Kevin Miller, D.P.M. Cartilage acts as a cushion that lines the joint. When it breaks down, it results in painful bone-on-bone grinding of the joint surface, Dr. Miller explained. There are two types of surgeries frequently recommended in such cases: ankle fusion and ankle replacement. In ankle fusion, a surgeon fastens together the damaged ankle bones with metal plates and screws. During the healing process, the bones fuse into one combined bone. Ankle fusion usually is successful in relieving arthritis pain, but it also reduces the ankle joint’s ability to move. In ankle replacement surgery, the ends of the damaged bones are removed and replaced with an artificial joint made of plastic and metal. This artificial joint helps the ankle retain more movement, so it provides more mobility. Jeremy had his concerns. “I did a lot of research and watched videos and the people in them were excited because they could walk to their mailbox. I was like, ‘I want to be able to do more than that!’” he said. Reassured that he would be able to have much more mobility, Jeremy had the surgery performed by Dr. Miller in March 2018. Surgeon Kevin Miller, D.P.M., felt that a total ankle replacement would allow for better range of motion and mobility for Jeremy. He’s back to hiking and hunting, too. He has advice for anyone else who’s been told they need to consider a total ankle replacement.